The Iowa Association of Municipal Utilities Safety Services department will be holding mobile crane certification and examination classes for digger derrick, service truck, and mobile crane operators. OSHA’s updated crane standard REQUIRES that operators of lifting equipment be trained, evaluated and tested in order to obtain certification. Although the new standard, 29 CFR 1926 Subpart CC, specifically exempts the digger derrick and the operator from meeting the requirements of the standard, the exemption applies only when it is used for work within the provisions of the power generation, transmission and distribution standards, or for construction work within the telecommunications standard. The exemption does not apply if the digger derrick is used for lifting materials or to operate in working environments outside the scope of the standard because the equipment is essentially being used as a mobile crane. For example, unloading materials from a truck, lifting a motor from a pump house to assist your water department, or providing assistance to any other city department will mean that the exemption no longer applies. When equipment is used as a mobile crane, all provisions of the standard apply, including the operator certification rule. OSHA also now requires that an operator be certified in specific areas when they operate equipment outfitted with a boom and winch and able to lift at least 2,000 pounds. This includes service trucks in your public works, or water departments. The new standard has very specific operator requirements, one being to obtain operator certification from an independent testing organization accredited by a nationally recognized organization. OSHA’s updated crane standard, 1926.1427 in Subpart CC, requires that for a testing organization to be considered accredited to certify operators, it must be accredited by a nationally recognized accrediting agency based on that agency’s determination that industry recognized criteria for written testing materials, practical examinations, test administration, grading, facilities/equipment and personnel have been met. IAMU is an Accredited Assessment Center through the National Center for Construction Education Research (NCCER). We are authorized to conduct both hands-on assessments and practical examinations which are part of our Mobile Crane Operator Certification Program. Additionally, we are offering Qualified Hand Signal Person and Qualified Rigger programs (available at a future date). Digger derrick and service truck crane operators who do not currently hold a mobile crane operator’s certification. Classes will be a week long, requiring classroom instruction, an on-line exam that has a 80% pass requirement, a practical exam for certification of mobile crane, and then finally a short class and practical exam for the signalperson and rigging qualifications. Students who pass the written and practical exams receive nationally recognized certification from the National Center for Construction Education Research (NCCER). Dates have been scheduled for 2019 at the IAMU complex (unless otherwise noted). Please click HERE or visit the IAMU website for available dates. Examination retakes are $100 and may be taken during any scheduled exam date. o April Class – Registration now open! o June #1 Class – Registration now open! All participants will attend classroom days. Exams will take place on the Thursday of each class session. Depending on the number of participants, Wednesday evening and Friday may also be used for exams. Study guides will be mailed for each participant to review before class. Each participant will need to create an account with NCCER before class; step-by-step instructions are included with the study guide. Please bring your account number with you to class. For additional information about the classes and online registration for each event, click HERE. 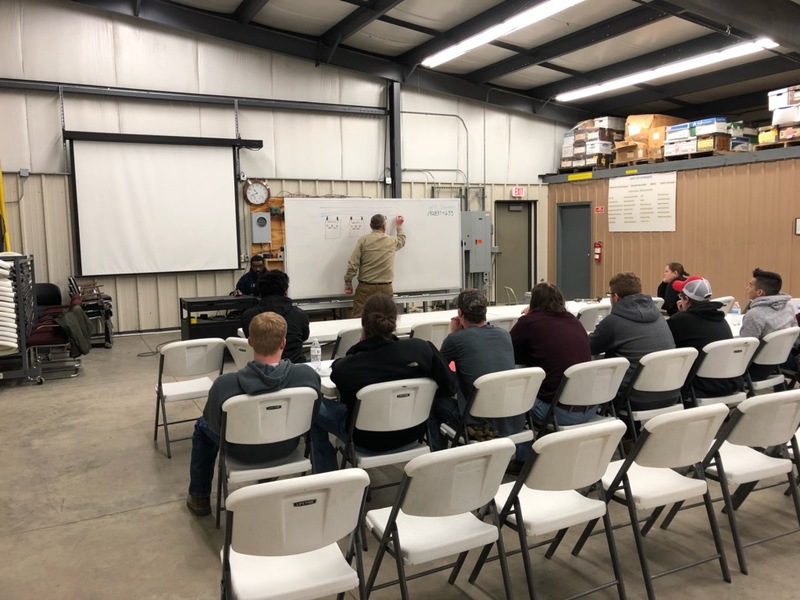 As part of the Iowa Energy Workforce Consortium initiative, IAMU’s Bob Hiatt and Dave Swanson conducted an “energy awareness event” on April 9 and 11 with students from Indian Hills Community College (Ottumwa campus). Fifteen students participated on the first day and 12 students participated on the second day. The event consisted of a host of hands-on activities both in the classroom as well as on the training field. The activities consisted of activities that would be typical to the electric utility industry. IAMU Safety Specialists hear about work-related injuries and near misses all the time. Often, injuries could have been or were avoided by following specific safety procedures and/or having the proper equipment. To help share these teachable moments, IAMU Safety Specialist Margret Meade has created a new publication called “Lessons Learned.” The goal is to provide real-life examples of what can happen and what should happen when it comes to workplace safety. The “Lessons Learned” highlight sheets will be available as downloadable PDFs. Feel free to print and post the highlight sheets in employee gathering areas, hand them out during employee meetings, and/ or distribute them electronically to others. If you ever have any questions about the highlight sheets or have lessons to share for publication, you may contact Margret at mmeade@iamu.org or 515.289.1999. All individual and organization names will be removed before distribution. 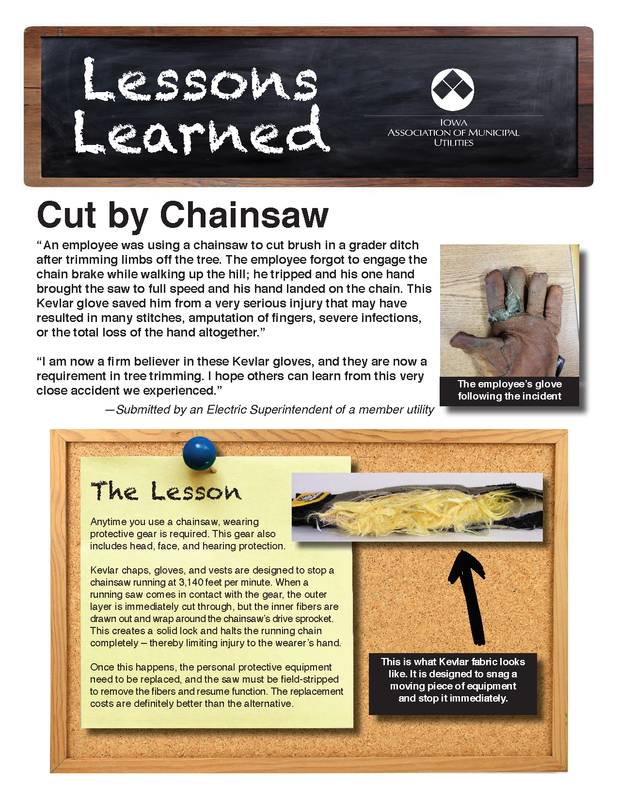 To view and download the first “Lessons Learned” on Chainsaws and Kevlar, click here. When members need help, they know they can count on colleagues from around the state. It’s the power of Mutual Aid (MA). IAMU Director of Member Services Dave Hraha was contacted by Brad Willemssen, Electric Superintendent from City of Sibley, last Thursday morning at 5:09 a.m. At that time, he was calling in with 45 poles down on their rural line to Bigelow. More poles went down during the event. 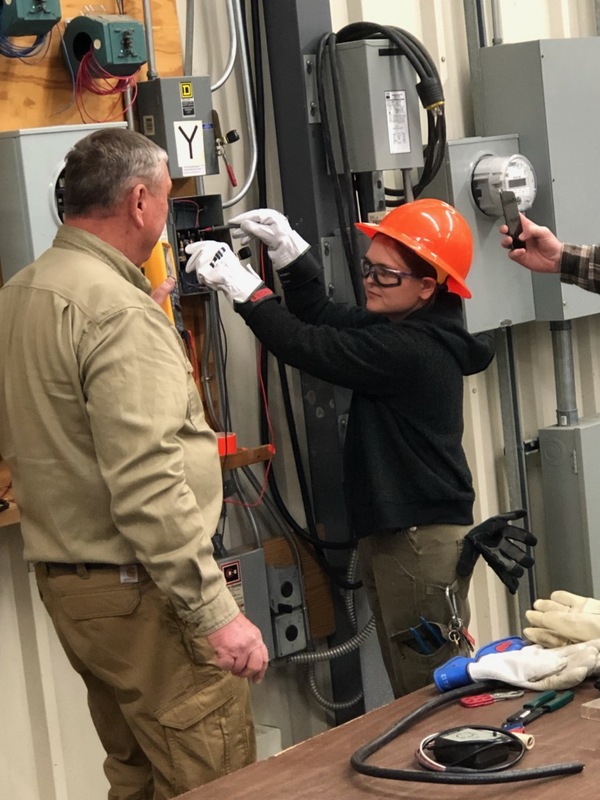 Hraha then contacted Roger Morris, Spencer Municipal Utilities Electric Manager and IAMU MA Primary Coordinator in Region 1, and John Bilsten, Algona Municipal Utilities General Manger and Secondary Coordinator in Region 1, along with Rod Vitchum, Algona Electric Line Superintendent. Morris and Vitchum led the response. Power was restored Saturday night.